While I finish off my review of Freshta I thought I’d share with you the pictures I managed to take on Monday night. Now, I’m currently an intern at Duckworth Publishers, and my boss Jamie had a ticket for Monday night, but was too ill to go, so very kindly gave it to me. This ticket just happened to be for an evening at The Cambridge Theatre in Covent Garden (where they do Matilda, hence the set) to see Neil Gaiman and Philip Pullman talking about Pullman’s new versions of the Grimms’ fairy tales. I thought, why not. 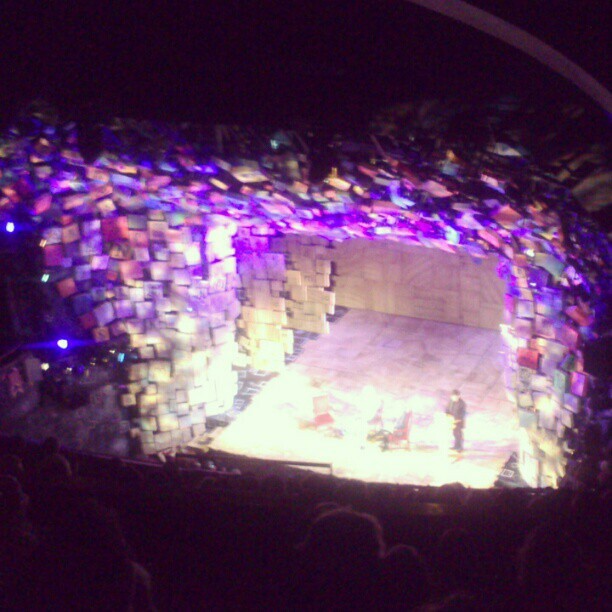 The evening was hosted/moderated by Rosie Boycott, and authors Meg Rosoff and Audrey Niffenegger stood in for Philip Pullman, with Rosoff chatting with Gaiman and Niffenegger reading one of his new fairy tales at the start. This was called ‘The Three Snake Leaves’ and was excellent. Gaiman wrote about the event here. The evening closed with Neil Gaiman reading a new short story of his called ‘The Click Clack The Rattle Bag’. It was terrifying and excellent, and is available to download from Audible. For every download, Audible will donate money to educational charities through BookTrust.org. Find out more and download the story here. Grimm Tales for Young and Old by Philip Pullman was published on 27th September 2012 by Penguin. The tenth anniversary edition of Coraline by Neil Gaiman was published on 2nd August 2012 by Bloomsbury. Looks like it was a great night, how fortunate you were able to go. Must read a Neil Gaiman soon. It was such a good evening – nothing groundbreaking but very interesting to hear Gaiman and Rosoff talk about the nature of stories, and why fairy tales appeal to us. They also talked about their own work and their own processes for writing, which was also great to hear about.